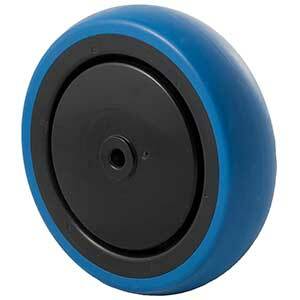 Grey rubber, blue rubber, black rubber and conductive wheels. 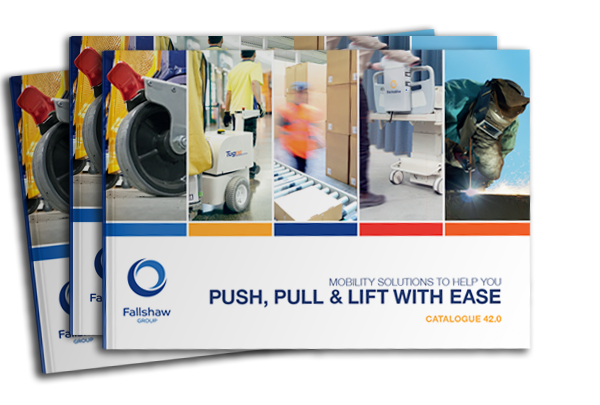 Applications include hand trucks, trolleys, wheelbarrows, lawn mowers, waste bins, hire buggies, floor polishers and toys. 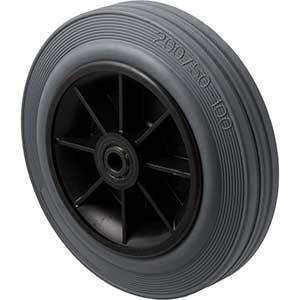 Grey rubber, flat profile, plain bearing. 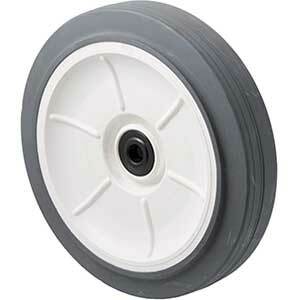 Grey rubber, non-marking, white polypropylene (PP) off set wheel, plain bearing. 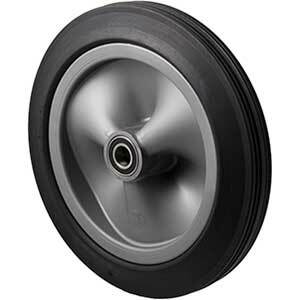 Also available to suit 5/8” bore (58). 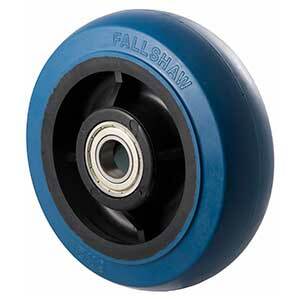 Developed for floor polishers and scrubbers. 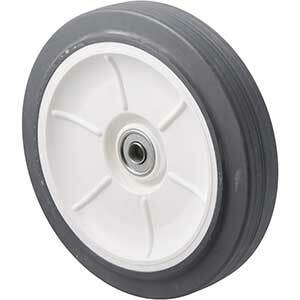 Grey rubber, non-marking, white polypropylene (PP) off set wheel, deep groove ball bearing. 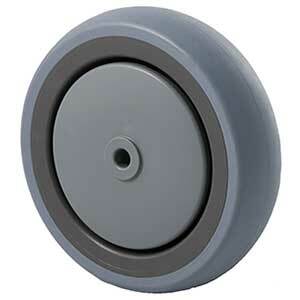 Grey rubber, round profile, precision bearing, thread guard. 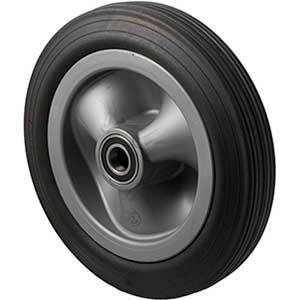 Grey rubber, precision bearing, thread guard. 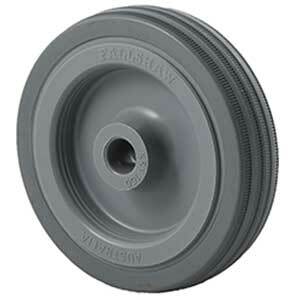 Grey rubber, roller bearing, optional thread guard. Blue high resilience elastomer, precision bearing, thread guard. 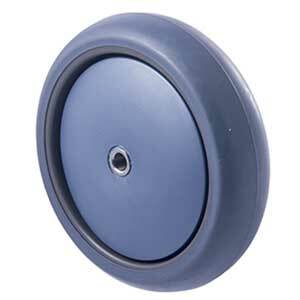 Blue high resilience non-marking rubber, precision bearing, thread guard. 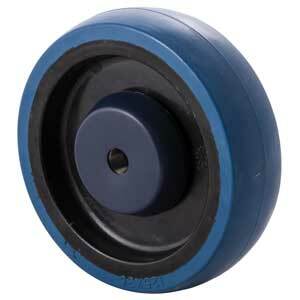 Blue high resilience non-marking elastomer, roller bearing, no thread guard. 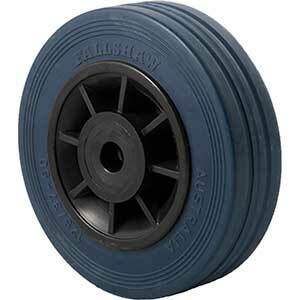 Blue high resilience non-marking rubber, precision bearing, no thread guard. 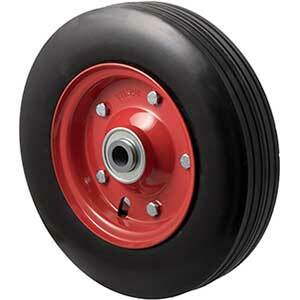 General purpose rubber utility wheel for lawn equipment and carts, deep groove ball bearing and off set centre. 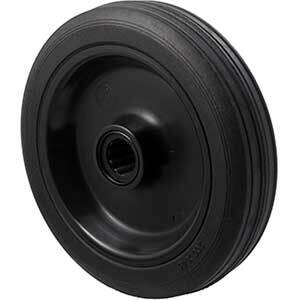 General purpose rubber utility wheel, used on light lawn equipment and carts, plain bearing. 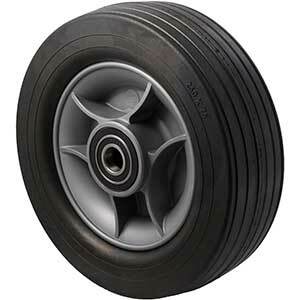 Optional hub cap available (order code: GHUBCAP). 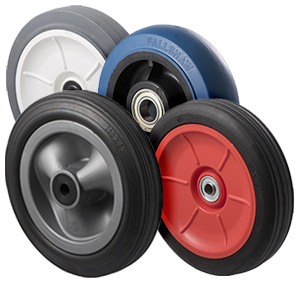 Medium duty hand truck wheels, deep groove ball bearing, high-impact polypropylene centre, 20 mm bore (-POYB20) or 3/4” bore (-POYB34). Puncture proof for wheelbarrows and utility equipment, precision ball bearing. Available in 20 mm bore (-PRYQ20) or 3/4” bore (-PRYQ34). 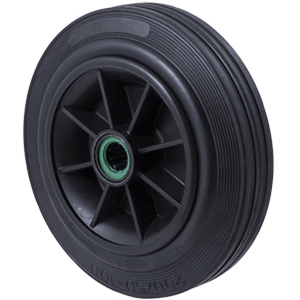 Puncture proof for wheelbarrows and utility equipment, precision ball bearing. 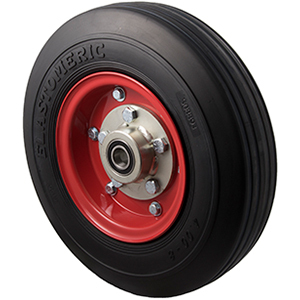 Available in 20 mm bore (-PRYQ20), 3/4” bore (-PRYQ34), or 1” bore (PRYQ25). 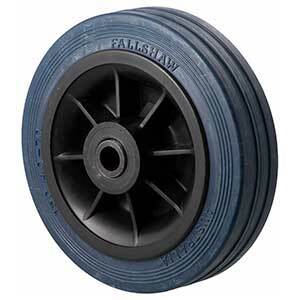 Puncture proof for wheelbarrows and utility equipment, precision ball bearing. Available in 20 mm bore (-PRWQ20), 25 mm bore (-PRWQ25), 3/4” bore (-PRWQ34), or 5/8” bore (-PRWQ58). 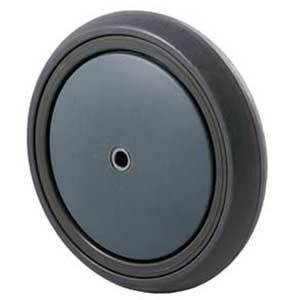 Black rubber wheel with roller bearing, for trolleys, carts and lawn mowers. Thread guard available (HRR200G). Solid black rubber wheel, with roller bearing, for wheelbarrows, utility equipment and waste bins. 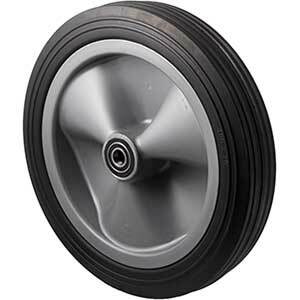 Puncture proof solid cushioned wheel, with deep groove ball bearings in sizes 1” (-SRBB10), 20 mm (-SRBB20), 3/4” (-SRBB34), or 5/8” (-SRBB58). 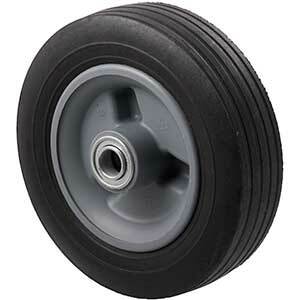 Heavy duty wheel, designed for towing, precision ball bearing. Max tow speed—15 km/h. Conductive TPE, precision bearing, thread guard. Available with stainless steel bearing (MAC).